We also planned to do a lot of things that we have never done before in 4 previous trips in the past 10 years – the Jungle Cruise, Liberty Belle, American Adventure, etc. But we also weren’t going to break our backs to do everything – after all, we’d be back in 5 months. We wanted to relax while we did everything. We own at the Saratoga Springs Resort, but we figured we’d like to enjoy the World Showcase at Epcot a lot more this trip. 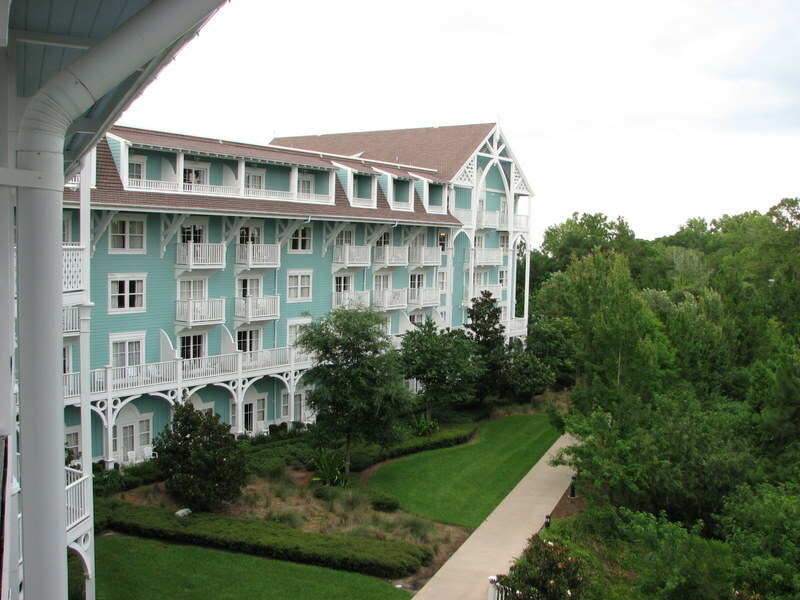 It was within the 7 month window to book at other resorts (4 months), but nothing was available, so I put us on the waitlist for either the Beach Club Villas or the Boardwalk Villas. 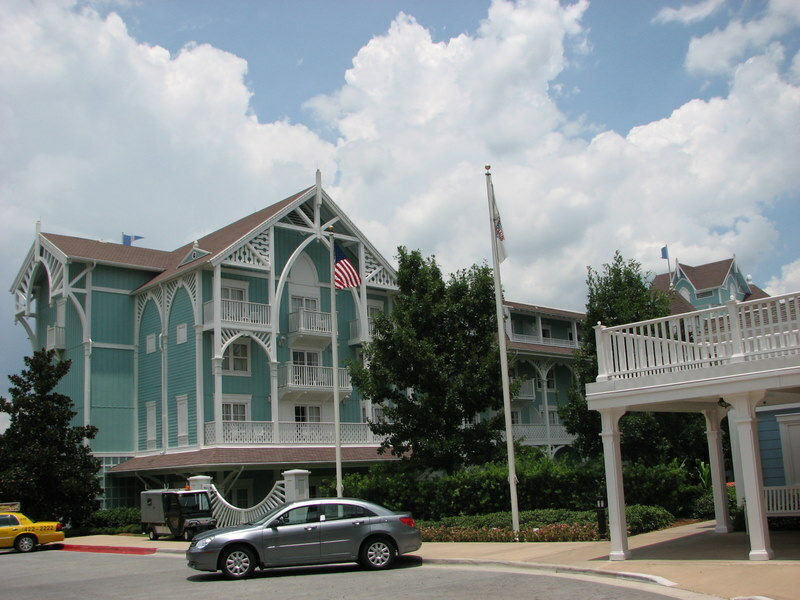 Within two weeks the Beach Club became available, and that’s where we stayed. If you are reading this, and see an abbreviation that you don’t understand, I’ve gotten used to the abbreviations as used on the DISboards. For instance, “DW” refers to “Dear (or Disney) Wife”. Here is a complete list if needed. You do a LOT of walking at Disney. Last year, after just two days, I got bad blisters on my feet. I had gotten a new pair of sneakers a month before, and I attributed the blisters to not breaking them in well enough. Well, this year I got new sneakers several months in advance, and broke them in good. I started getting blisters by the end of the first day. I had even bought BodyGlide, which is a stick kind of like an antiperspirant, but didn’t put it on the first day, and after that it was too late – it made things a little more tolerable, but the blisters were still forming. I think it is because I have a habit of tying my sneakers loosely, and just slipping them on and off. DW had gotten Disney Crocs some time before we went, and loved them. She wore them every day, and didn’t have problems. On Day 2, I tried a pair on at the Beach Club Marketplace, and noticed cheap jerseys that they did not rub on any of my blisters – and they were, in fact, comfortable. Ugliest footware on Earth, but my feet hurt. I’d rather look like I was wearing Goofy’s shoes and be comfortable than look normal and wincing with every step. However the Marketplace only had black with a red strap and red with a black strap in Adult XL, so I waited until that night and went to Downtown Disney. Alas, they had the same colors – apparently those are the only colors in the Disney Crocs. So I bought a black-with-red pair, and wore them the rest of the trip (with socks), except to California Grill. My feet were never happier. I wasn’t necessarily up to full speed – I could still feel that I had blisters, but they didn’t get any worse and there were no stabbing pains when I walked. I could get around fine without fear that I’d be leaving trails of blood around WDW. These things are coming back with me in December. We had an 8:45am flight on JetBlue out of Boston. We usually like flying out of Manchester, NH – parking is cheaper and there is generally no traffic, but JetBlue doesn’t fly out of there and they had the most reasonable prices available at the time. It was our first time flying with JetBlue, but we’ve heard good things about them, and after the fun we had last year with U.S. Airways, they were never considered. I didn’t realize it but JetBlue names each of their planes with some form of “Blue” in them (with a couple of exceptions). “Absolute Blue” and “Forever Blue” were at other gates. Ours arrived, called “Bright Lights, Blue City”, an Airbus 320. Their plans offer decent legroom, and the best feature I think is the DirecTV feed at each seat, which you listen to via provided free (but low quality) headphones or better ones for $1, or use your own (which I recommend). You get national feeds for the 4 major networks, major cable networks, and some in-flight FOX movies for a fee. And if you are curious about where you are, there is a GPS-driven locator channel that shows where your plane is, direction, altitude and speed over a simplified Google map. Having the TV provides enough distraction to make the trip go faster. 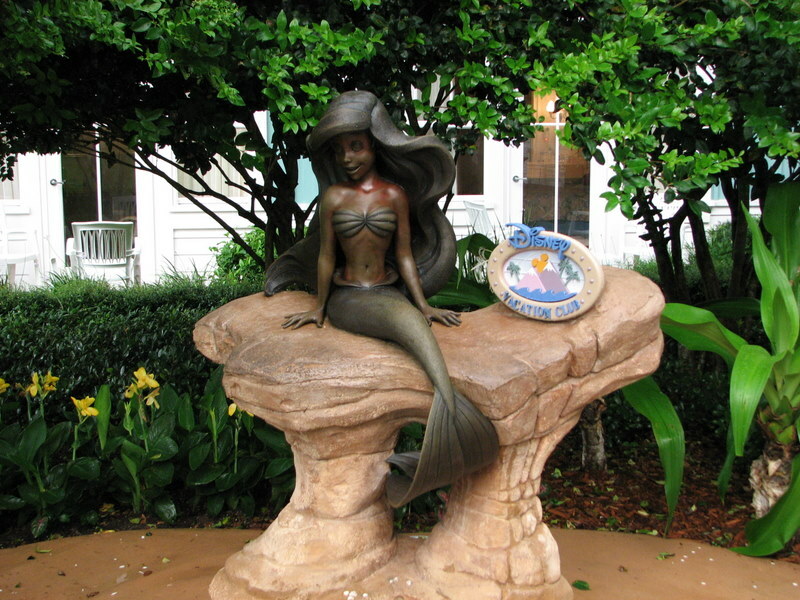 Arrival at Orlando was pretty typical – picked up our bags, and found a courtesy phone to call Payless, Disney’s who we had a rental reservation. Waited no more than a few minutes outside before the van arrived and took us over to the rental place. The driver pointed out the Hooters location to use as a landmark for returning the car. Payless was pretty old-style for a car rental company. Offsite location, wait in line, they try and upsell you to a more expensive car, etc. We ended up with a Dodge Caliber, which is a 4-door small wagon-style hatchback – plenty big enough for the two of us, even though he tried to upsell us to Camry. While I was waiting in line, there was a man in front of me on crutches. Then a couple he knew came in, and they decided that they didn’t need to wait and butted in to get helped while the guy on crutches went to sit down. I ended up next to them at the counter, and heard what was going on. Apparently they were involved in an accident (not their fault), and the car was wrecked, and they were there to get another car – but the original car was somewhere else, and it was unclear where it was. Payless didn’t want to release another car to them until they had possession of the first. It later came to light that the woman was driving at the time of the accident, but she wasn’t the person on the contract and thus wasn’t permitted to drive the car, at which point Payless said they would not give them another car at all, and would bring them to some other rental place. They would also still be charged the full amount of the rental at least until they received the original car on property, at which point the woman was yelling that she would cancel her credit card right away so they couldn’t charge it, yada yada…I simply got my keys and found my car, and we were on our way. A short time and $1.50 later in tolls down the Beachline (it used to be called the Bee Line, but I just learned that they changed it a couple years ago) and we were in the area. We drive down I-Drive just to do it as we haven’t been down it in a while. We could see the build up of Sea World (haven’t been there since our first trip in 1997 – it’s totally different), the new Aquatica water park, and more and more developments. We stopped at a Walgreens to get some bottles of water, and then we found our way to the Beach Club Villas around 1:30pm. 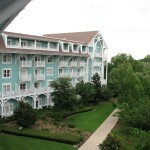 BCV is a separate building of the same design as the standard Beach Club Resort, although the building is a light green instead of light blue. 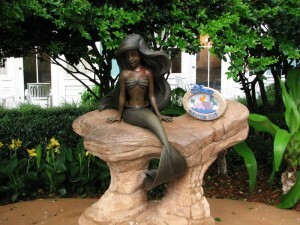 As such, it shares the front desk, which is located in the BCR building, so we walked past the BCV pool, over to the BCR building, and found our way to the lobby and checked in. They gave us our Welcome Home package, and we trundled back to the BCV to find our room, 425 (studio). We went up to the 4th floor and found our room quickly – it was the first room on the right, next to what I believe was a maintenance closet and the elevators. I’ve heard people have had issues with rooms next to elevators, but I think there was enough separation that I heard no elevator noise (and I notice these things) and noise down the hallways was never really an issue. Our view was from the inside corner overlooking a path with a bench and some jungle-looking trees. We didn’t realize it at the time, but following the line of the building looks towards the World Showcase lagoon. Otherwise we couldn’t see much, but we aren’t sticklers for a view. For those that care, we had a CRT television and a DVD player. And yes, you can still watch the 24-hour Stacey channel. Our plan for Day 1 was mostly to be in the Magic Kingdom, but since we thought we’d need to pick up our Disney Dining Experience (DDE) card at Epcot Guest Relations, we planned to go in through the International Gateway, do a few things, and then take the monorail over to the TTC and then the Magic Kingdom. We actually got our DDE card sooner than expected, but the plan seemed reasonable anyways. We went to the International Gateway to get our Annual Passes, and also get our Anniversary pins. Although they don’t provide you with any benefits, cast members seem to be trained to at least recognize the pins and make you feel extra special. 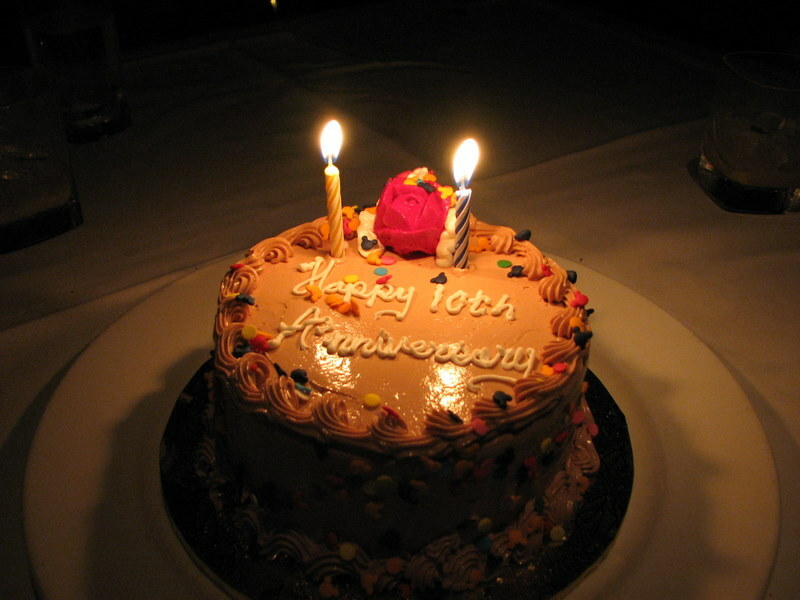 We got many “Happy Anniversary” and “How Long?” comments from CMs, and they do seem to do a little extra when possible. Upon entering, we stopped up in France for the Grey Goose and Grand Marnier slushies as recommended on the Disboards. We got one of each. I liked the GM, DW liked the GG, so it worked out well for both of us. The GG tasted like a frozen lemonade, and the GM much like a orange creamsicle. Then we came back down through England with a stop at the Fish and Chips shop next to the Rose and Crown for, of course, Fish and Chips, since we hadn’t eaten anything except a snack on the plane since early that morning. 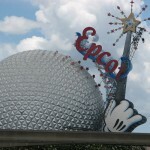 Then one last thing – Spaceship Earth. Today was the last day before the long rehab, so we decided one more run of the “old” version. There was no wait. Outside there is a huge crane that is going to take down the “wand” that sits next to Spaceship Earth. Then we hoofed it over to the monorail and took off for the Magic Kingdom. We switched monorails at the Ticket and Transportation Center for the Magic Kingdom Express, and managed to sit up front with the driver and another couple. I’ve done it once before on our last trip with DD#1, but DW had not. We had a conversation with the other couple about the closure for refurbishment of Haunted Mansion, and I mentioned Spaceship Earth closing the next day – apparently when they were by there it was more like an hour wait, so they didn’t go on – not realizing it was closing. 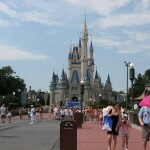 We got to see the dirt piles that may one day become a DVC resort, but soon enough we were at the Magic Kingdom. Over in MK, I saw the reason why Heelys aren’t allow in the parks, although the cast members tend to be lax about enforcing it. A woman and her two kids were walking in front of us up Main Street. The son kicks out his Heelys and starts to skate – right into the trolley tracks. He goes down face first – and he was holding a digital camera in front of him, which is now in pieces scattered on Main Street. He was fine, but the camera wasn’t. I found the memory card by my feet and let them know where it was. The memory card appeared to be the old SmartMedia format, so perhaps it wasn’t that old a camera. We wanted to just basically hit certain attractions that DW and I could ride together that we haven’t been able to on our last couple trips due to the kids. We headed into Tomorrowland. Although we weren’t planning to do the Laugh Floor until December with the kids, the wait was only 5 minutes so we decided to check it out. They’ve worked a lot on this since it opened, and although still a bit rough around the edges, parts of it were quite funny, including a couple of the jokes sent in by texting from mobile phones. From there we got Fastpasses for Space Mountain, and decided to head back over to Adventureland next. The first thing we had to find – Dole Whips. Everyone raves about these, and we love pineapple. We decided to split a float (Dole Whip on top of pineapple juice). I have to say that everyone was right. It is delicious, and amazingly refreshing. I can’t think of anything better on a hot humid day. From there, it was a quick hop onto Pirates of the Caribbean with a 10 minute wait, and then over to Splash Mountain. It was listed as a 80 minute wait! Apparently it was broken down, with people still on the ride. We can’t get another Fastpass yet, wholesale NFL jerseys so we decide to check out (our first real “first”) Tom Sawyer’s Island for a bit. It’s basically a walkthrough attraction with a Huck Finn theme, but really there is very little to do there except waste some time. We headed back across on the next boat, and rode Big Thunder Mountain instead with about a 30 minute wait. We can then get a FP for Splash Mountain, and head back to Tomorrowland and grab a bite at Cosmic Rays. After that, we entered the Space Mountain FP queue, and got about 2/3rd of the way there and stopped. Apparently there were “computer issues”, and a CM came down the line and said it could be between 15 minutes and 2 hours (which I think is a fairly standard answer for “no idea”), and that the computers needed to be reset. Fortunately it was “sooner” rather than “later” and everything got moving again. After this we picked up our EMH bracelets in case we decided to stay late. Oddly, they did not scan the room keys, only visually inspected them this time, unlike last year. Then we took a quick spin around in the Carousel of Progress. Yes, it really is open. Has been nearly daily for years. It just never looks open. It’s an important part of Disney history and everyone should view it at least once. Then we hit our second “first” – Astro Orbiter. Because the wholesale NFL jerseys ride is a slow loading rotary ride much like Dumbo, Flying Carpets, etc., and aggravating that is the Controls elevators up to the loading level, the line always looks intimidating. But the difference its its high up in comparison to the others, and to add to it – it is pretty dark now, so we ride. I found it somewhat uncomfortable – it is a straddle bench seat (think like a waverunner) with the only back support at the very back, and the control yoke to raise and lower the rocket is way up front, and being a somewhat big guy DW and I rode separate rockets, so it was a long reach to control it. Going up high was cool, and it tilts you inward as you go around – but go low, and you are tilted outward – and the forces push you uncomfortably to the outside – I had to go back up just to be comfortable. Soon enough it was over, but it was cool being up high seeing the bright lights whipping around. We could see the SpectroMagic parade starting from up there. Now it was time to head back to Splash Mountain – except SpectroMagic was in the way. So we had to wind our way all the way around via Fantasyland to get there. By this time my feet were getting sore (see my story about my feet in the Introduction), so the extra mileage wasn’t appreciated. We get back to Splash Mountain, which now has a 10 minute standby time. Why? It was broken down again. 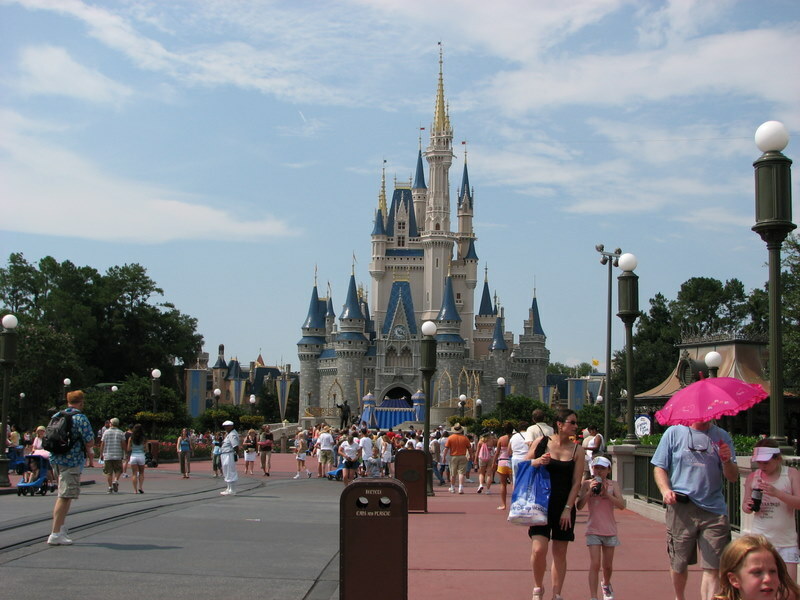 They weren’t letting anyone in the lines, and they have no idea how long it will be, and would only say that you could come back anytime with a Fastpass – except its getting late, and those without EMH privileges don’t have much longer. We stick it out for a few, and shortly after some confusion where the standby CM started letting people on while the FP CM didn’t, they opened the FP line. The problem was that there was no organization – everyone pushed forward at once. After some pleadings (including from me) things start to calm down, except for one group of about three people who locked hands and forced their way through. They were stopped and yelled at by one guest for pushing him, but they just pressed on. I told them at least to go through individually and regroup on the other side, but they ignored everything and pushed all the way through, while the CM did nothing about it. Everyone else was far more calm about it at that stage, and we all made it through without further incident. Ironically, with the delays, we happened to be right at the top of Splash Mountain when the Wishes fireworks began, which was quite beautiful. However, we were also sitting right up front. Which means we are getting very wet. It was nice and cool though…we got to see some more of Wishes after we wiped our eyes clear, and also as we left the area. We decide not to stick around late, but figured a little drying time was in order, so on our way back to the entrance we go for our third “first” – the Jungle Cruise. And true to the stories, our Jungle Cruise Guide, Tyler, filled the ride with plenty of bad jokes, making fun of the ride, himself, and the fact that we were getting off the ride in a few minutes, but he was stuck on it for another FIVE hours. We will definitely be bringing the kids on this one. We stopped at Casey’s for a large soda and catch a Yacht/Beach Club bus just about to depart, and end our first day, for which my feet were eternally grateful, as I was already developing blisters. Day 2 started with a problem. The tub drain was clogged, BAD. It took so long for the shower to warm up that the tub was filled with two inches of cold water before we could get in. It was a weird feeling with warm shower water and cold feet. On our way out to MGM we stopped by the desk and notified them of the problem. Despite my feet, we decided to walk to MGM, as I’ve heard it is generally faster than the boat, so we took a leisurely walk. It was morning Extra Magic Hours, and everyone was crowded in front of the turnstiles – unlike previous times they did not allow anyone at least up the road for a rope drop at open time. Once it was time to open, everyone filtered through the turnstiles. Our original plan was was to actually head over to Lights, Motors Action and get a FASTPASS for the first show to guarantee a seat. When we went last year, we sat in line for over an hour only to have the show cancelled due to the weather, and we wanted to make sure we saw it this time. However, we decided to head to Rock’n’Roller Coaster and Tower of Terror first before it got too busy. We got FASTPASSes for Tower of Terror, then went down to Rock’n’Roller Coaster – only for them to say there were “technical problems” and they weren’t letting anyone in. Unfortunately we couldn’t get a FASTPASS as we just got one. So we went back and went standby through Tower of Terror, which was only about 20 minutes. While we were high up, I was able to see that RnR had opened, so we immediately headed there when we got off. We went standby on RnR, which again was only about 20 minutes. In line we enjoyed talking with a man and his granddaughter from Louisiana, and the girl was a bit apprehensive about the ride doing loops. We explained that she’d never really notice when she’d be upside down, and how the ride is dark with lighted signs and such that you pass so you don’t really know what way is up, and the catapult launch. We rode in the same car, with us in the very last row, and after the ride she said how much she loved it. On our exit, we head cross-park over to get the FASTPASS for Lights, Motors, Action – at least as fast as my feet would take me. But when we almost get there, a CM named Kathy on the way out seemed to know what we were heading for – and said there were no FASTPASSes. I mentioned we were hoping to get them because we missed the show last time and wanted to make sure we got to see it this time, and I don’t know if it was because of that and/or our Anniversary buttons but she asked us to wait, and after a few minutes came back and explained that we were on the VIP Seating list, and to just see the CM at podium at the entrance when it was show time. We thanked her profusely, and then looked around at what else to do in the meantime – there were very few people down this side of the park. We decided to head to the Backlot Tour, which we hadn’t really planned on doing but had time to kill now. I was surprised at how many people were in line given how dead the streets were outside. It’s not the same as it was since they took all the space for Lights, Motors, Action but it’s not bad. They still do the pre-show demonstrating the water and fire effects in the boat attack, drenching some volunteers. Then the tram rides around showing some props from movies, and Disney’s old plane, and some backstage areas for LMA. 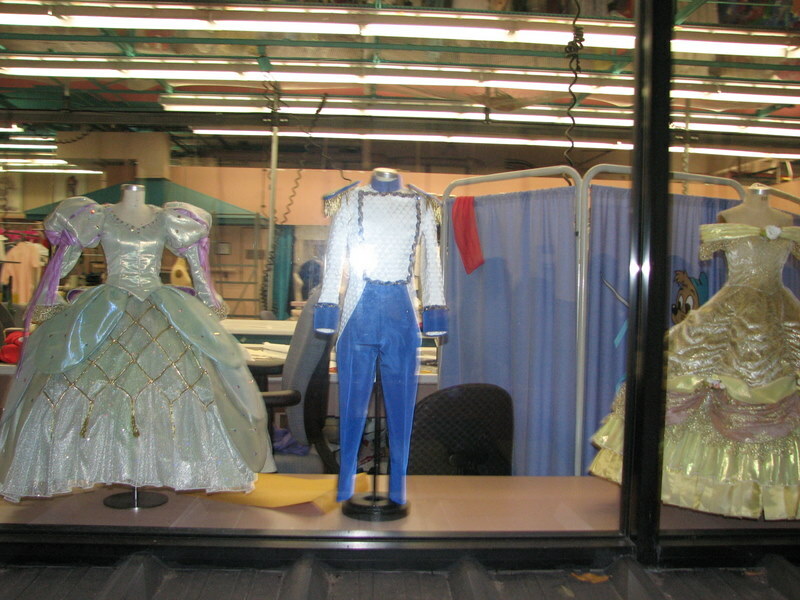 You still travel through the building, and they still actively do costuming there – I believe the guide said they make the Cast Member outfits there. 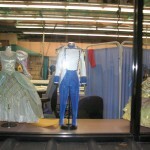 There were also displays of various costumes. Where they used to have the plane interior used for shooting is now filled with tires for LMA – you can still see the painted sky background on the wall. In the last part of the building, you could see various pieces from the Haunted Mansion in line for refurbishment – the harp, some paintings, etc. Of course, you ride through Catastrophe Canyon still, with the scripted “they are actively filming” shtick, and you can get wet and roasted at the same time. 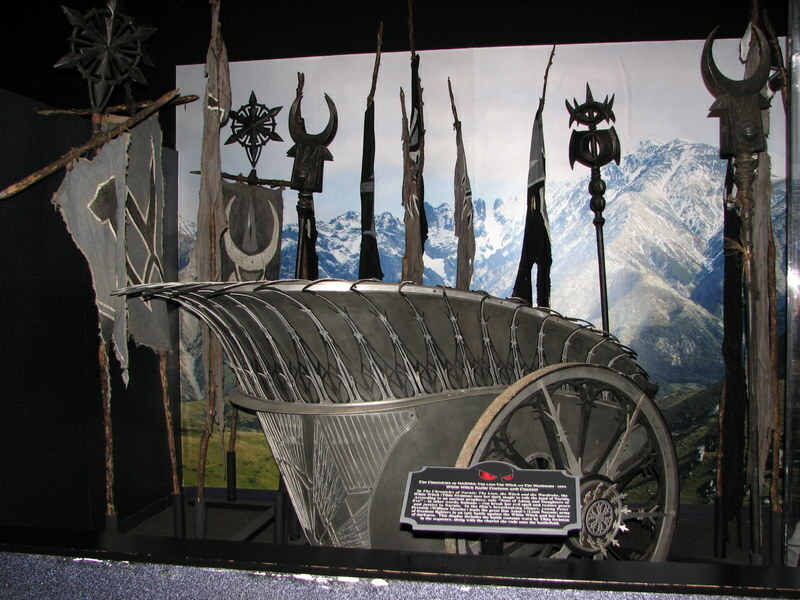 The ride ends and you enter a building with various costume and associate props from various movies. Darth Vader is here, as are several costumes from The Lion, The Witch And the Wardrobe, moved from the mini Narnia exhibit. We forgot to visit the Narnia exhibit to see if it had changed from last year, but I’m expecting Disney to expand on this property at some point. After that we killed time with a frozen ICEE-type drink and sat in some chairs waiting for LMA while the Power Rangers came in and signed autographs. They apparently have Rangers representing several different shows, in case you were wondering about the inconsistency in their costumes. We also saw Lightning McQueen and Mater come out for a meet and greet, and snapped a couple pictures. The show itself was awesome. They move around very fast in those specially designed cars, and they do tricks with VERY little clearance between each other or obstructions. After this we still had time to kill for our 1:20pm reservations at Sci-Fi Dine-In, so we decided to go somewhere cool – Sounds Dangerous Starring Drew Carey, despite the show’s critics. We had never seen it, and we like Drew Carey. I’d say it is worth seeing once, so long as you don’t have a problem with a completely dark theater. If nothing else, it is a cool break. Then it was time to eat. We only had to wait a few minutes, while I noticed they turned away all walk-ins. This is another place that is regularly panned, but we wanted to try it. We found the burgers to be good, the frozen drinks good, the service good. There just wasn’t a lot of table space. And being an old Sci-Fi nut (after all, I have various web sites on it), I was “seen it, seen it, don’t remember…”. Most of the movies seemed to be of the “female aliens try to take over the Earth” variety. In general, we enjoyed it. 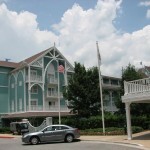 After that, we decided to head back to the Beach Club and check out Stormalong Bay before heading to Downtown Disney. Only afterwards did we realize that we totally forgot to go on the Great Movie Ride and a few other things in that area – but we have plenty of time in December to make up for it. We took one of the Friendship boats back to the Beach Club. On getting back to the villa, I noticed that nothing had yet been done about the tub. We changed for the pool, and then stopped by the desk again on the way out. To get in the pool area, you have to show your room card, and you get a wristband – much like Extra Magic Hours. 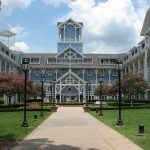 Stormalong Bay is one of the most popular resort pools and serves three resorts (Yacht Club, Beach Club and Beach Club Villas), and they are strict at preventing pool hopping – even DVC members not staying there aren’t allowed (DVC members are allowed to pool hop to all resort pools except Stormalong Bay and one at the Animal Kingdom Lodge). 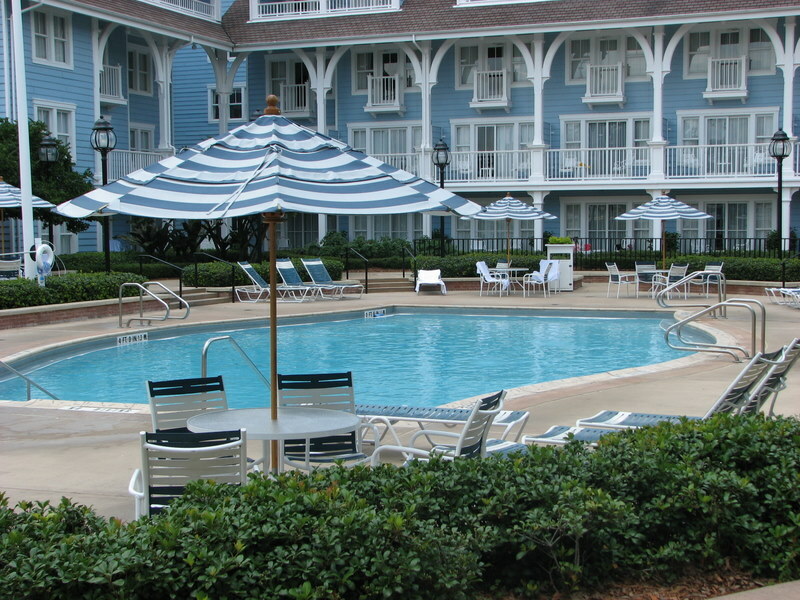 There are several pool areas, most of which have a sandy bottom – really unusual for a pool! One of the pools even has a sand bar in the middle where kids can dig and play. 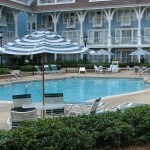 It’s probably the closest you can get to a beach where you can swim at Disney! There is also a small lazy river connected to some of the pool areas – but the depth of the lazy river was pretty big – up to 8 feet! Not for a small kid. There is also a big water slide – but to use it you actually leave the pool area, cross the main path to the canal beach area, and climb up a spiral staircase to what looks something like a crow’s nest on an old ship, which is the start of the slide. The slide tube goes straight down from there back into the pool area, does some turns, and then you come out in one of the pools. DW went first, and I followed. I was wearing a T-shirt (I’m Irish, which means I can get a sunburn from a 60 watt bulb), and I think this actually caused a problem. I almost came to a stop inside the tube, which couldn’t be a good thing if someone else started down! I managed to lay a little flatter, while holding my swim shoes (you can’t wear them down the slide – they’d probably stop you dead if they touched), and sped up again. One other slowdown around a curve, and cheap nba jerseys then I emerged in the pool. After a while, we headed back to the room to relax for a while. Maintenance still hadn’t showed up, but did within a few minutes. The guy took apart the drain and fished out a bunch of hair – but it was still clogged! After a few minutes without success he said he’d need to get a pipe snake, and would be back shortly. I had hoped to shower before going out again, but the tub had various parts strewn about it. We rested for a while, and the guy return with another, and they ran the pipe snake in, and pulled out more globs of hair – and still it was clogged! He made a phone call and it sounded like he was saying they needed to call in a plumber, and then he said they’d be back later. We just got dressed and headed out to Downtown Disney. We had 8pm reservations at Raglan Road, but wanted to shop a bit. Our kids wanted a stuffed Donald and Daisy Duck, but amazingly at World of Disney we couldn’t find one of the same size as the others they had (15 inches I think) – in fact, they didn’t seem to have them of any size, except in a very small size in some wacky outfit or something. We did, however find them at the Once Upon A Toy store instead. We looked around a few other stores, and stopped in the LEGO store to get some Star Wars LEGO keychains for my sister. I did break down and buy some black-with-red Crocs to appease my feet at World of Disney. 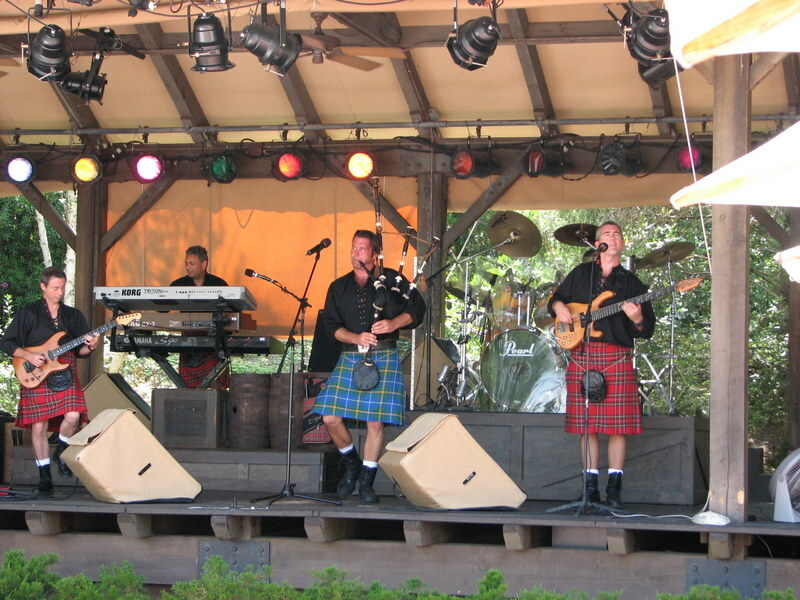 After that, we headed into Pleasure Island and right for Raglan Road, and got seated a bit early. It was a bit larger than I thought, with a big bar area and nicely styled. We got seated at a table for two, right next to the stage – that is to say, right next to the big square post next to the stage. I could lean back and see a drum set, but entertainment wouldn’t start until 9pm anyways. Our server, whose name I forget but was wonderful, helped get us started. To drink, I chose the Four Provinces Beer Flight – that is, 4 small glasses, one each of Guinness, Harp, Black and Tan (Guinness and Harp together, when poured right has the Guinness floating on top of the Harp) and I believe Murphy’s Irish Red (it was a Red Ale, and definitely NOT Killians). The latter was the only one I hadn’t had before, and was pleased with the taste. DW had a White Russian, and we had the Drunk Chicken (strips of grilled chicken with a whiskey glaze) for an appetizer, which had good flavor. For an entree, DW chose the Fish and Chips (of course), while I chose Kevin’s Heavenly Ham. The Fish and Chips came in a paper wrapped cone set in a vertical stand, which looked good but you really had to take it out and set on the plate to eat. The fish, frankly, was very bland. The batter, supposedly made with beer, really had no flavor at all, and that’s the important part, since the fish normally used is not strong tasting. For dessert (which I don’t normally order – I’m usually quite full after dinner and I don’t need the calories), based on some reports on the DISBoards, I knew I had to try Ger’s Bread and Butter Pudding. Basically, it is a (soup-style) cup full of pieces of buttered bread with raisins, over which you drizzle some form of sauce – in this case, a vanilla sauce and a caramel sauce. The server recommended cutting out the middle and setting it aside, and then placing the sauces in the middle, and then proceed eating, which is what I did. It was incredible! It may sound like a strange combination, but it just works. Alas, if you are generally full adding something containing bread just makes it worse – I was only able to eat a third of it as I didn’t want to feel like I would explode for the rest of the night. Just as we were finishing, the band had taken the stage and started. I sat back a bit and I could see the backs of the band members as they played. 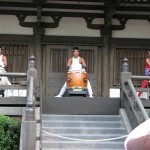 I would be able to see a drummer at the drum set, but there wasn’t one. I could still enjoy the music and was clapping along, and the female member of the band had looked over and smiled, kind of acknowledging that I was there and enjoying despite the less than ideal location, while DW could at least see their faces. We stayed for a couple songs but I didn’t want to tie up the table any longer, and we had one more stop before turning in for the night. 8 years previously, when we came to WDW with a large group of friends before everyone had kids, we discovered the Adventurer’s Club at Pleasure Island. We were practically there every night (and recognized by the cast members), and still have the keepsake Adventurer’s Club canteens that you could get your drinks in. DW loved the Kongaloosh drink, and I liked something whose name escaped me in the intervening years, but they don’t seem to have anymore anyways. In two trips since, we hadn’t made it back due to the kids, until now. 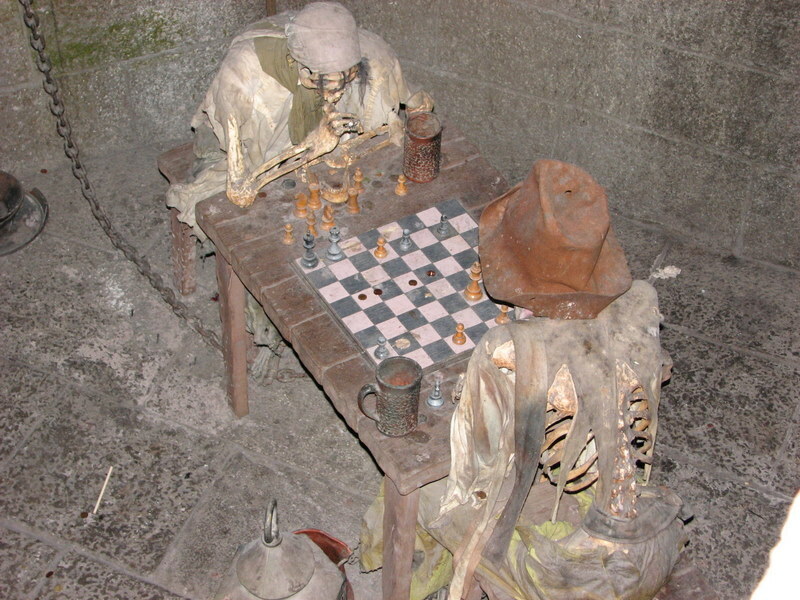 If you don’t know what it is, the Adventurer’s Club is a strange place. It’s decorated in the way a club in 1937 might be decorated – when the club members are eccentric adventurers finding treasure in the most simple of items. A large statue of Zeus stands in the middle of the central salon room, holding a fishing pole. There is a large granite mask of a pseudo-Babylonian god, a large moose head, etc. Only here, some of these things come to life and speak. 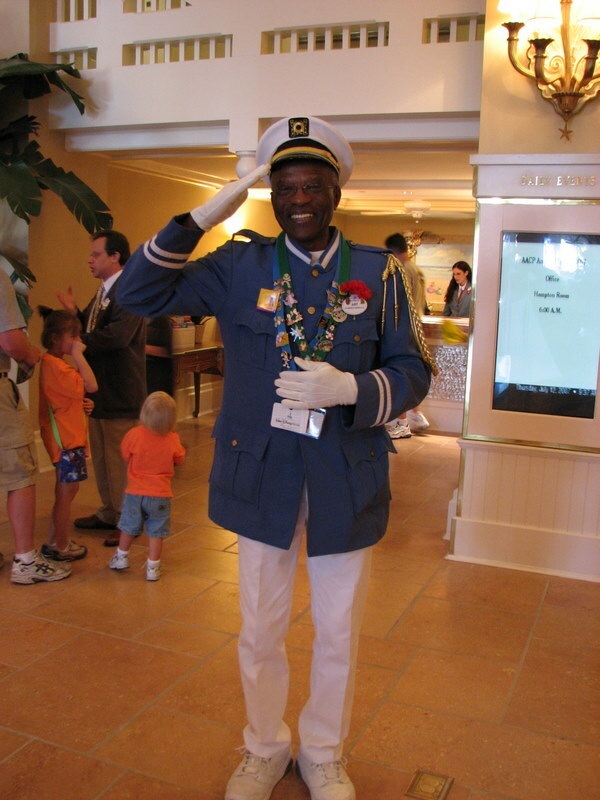 And don’t forget the Colonel, who hangs on one wall and when woken up will interact with the cast and guests, and lead everyone in the Adventurer’s Club theme song. During the night, the cast members (and they really are – they are playing parts) come out and interact with the guests, and in essence performing various skits with some level of improv. Although the cast members have changed in the intervening years, the show really has not – but even having seen it before it is no less fun. Some stuff takes place in the salon room, with occasional small shows in two adjoining rooms – the Mask Room (where there are two masks that tell jokes), and the Treasure Room (where you may just see the disembodied head of a genie…). Most of the main stuff happens in the Library, where there are tables and chairs and a bar, along with a stage where the performers act out a particular show. Several shows are done each night, and there is some order to them – you could spend the entire night there and nothing is repeated (until the next day). In fact, I don’t think it is possible to see everything, because as a show is going on in the Library, something else could be taking place in the Salon, or one of the other rooms. And sometimes the performers can run from one room to the other, and things might not make a whole lot of sense unless you’ve been on both sides! Come back on a different night, and you could see the same performers, but in different roles! On this particular night, the part of ladies’ man Hathaway Browne was played perfectly, with something of a Jim Kirk-style delivery. And Emil Bleehall (whose costume has changed from plaid jackets to a scout uniform) was played by an older gentleman who looked awfully familiar, but I haven’t been able to figure out why. We only caught one show in the Library (“The Balderdash Cup Competition”), before we decided to head back to our room and put an end to Day 2 – but we will be back in December to take in more shows. Today was a totally Epcot day. It was not morning Extra Magic Hours, but evening (although DW was convinced it was at another park – important later on). We entered through the International Gateway, and were held by a rope drop right where the bridge to France is located. Two teens were gearing up for a sprint to Soarin’, barefoot! I didn’t intend to run at all (still had blisters, but wearing Crocs now). I was able to walk OK, at normal speed. I didn’t know how much this might put us at a disadvantage on getting to Soarin’, given that everyone else would be coming from the main gate. We get over to Soarin’ – skipped Fastpass and went standby – 20 minute wait posted, but more like 30 (I was the “rabbit” – the one who carries the red timing card). The wait wasn’t bad either – they have reworked the queue significantly, and put in an interactive game for the people in line. 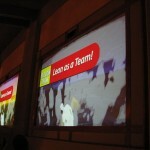 There are 5 giant screens on the wall (although only 4 seemed to be part of the game, at least at this time). 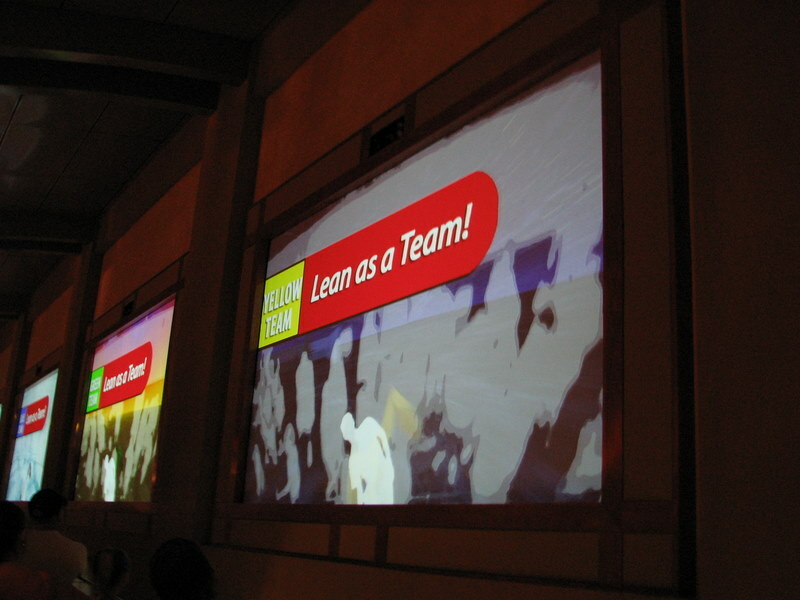 Everyone in the section in front of a particular screen was on a team, and they had to all lean left or right on order to steer their avatar in the game – which was one of a variety of birds. Then it was a race between the four teams to complete a course, flying around trees and rocks. Each Offers screen also represented a different season – summer, winter, etc. 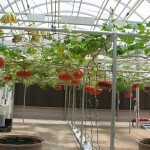 although the course was identical to each. You could tell that as people grew tired of it and stopped participating, it became more difficult to control. We, unfortunately, were in front of the 5th, non-participating screen, and we were past it before the game began again. After we got our positions for the next ride, we went in – and there were two people already in our seats – the CM forgot she had some reserved seats (for a Just Married couple), and we had to go back out and wait – but she gave us a Rider Switch Pass (essentially a free Fastpass for both of us good anytime that day) in compensation. We grabbed a Cinnamon Roll from the Sunshine Seasons for breakfast before heading back out. 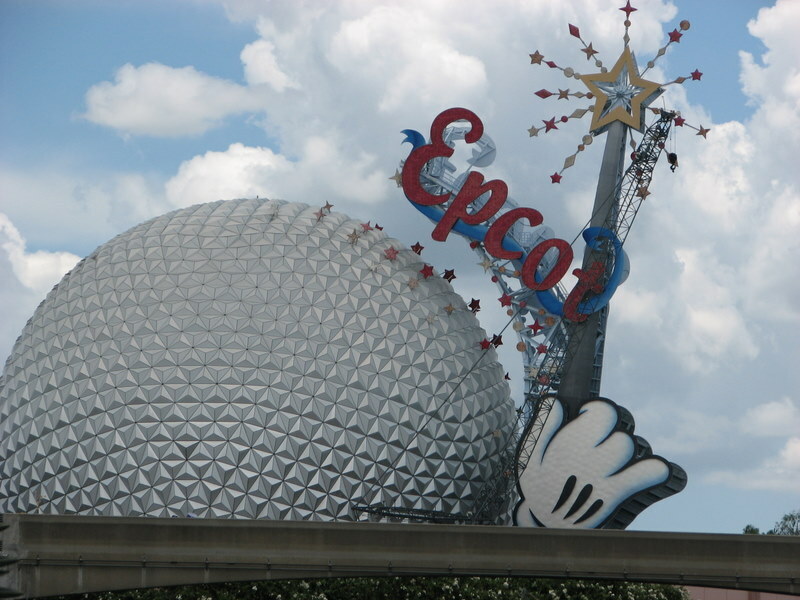 From there, we were going to head to Test Track and Mission: SPACE. On the electronic board near The Land, it said the wait times were short – 10-15 minutes for both. It was wrong. When we got over to Test Track at 10:30, wait times were up to 45 minutes already. The electronic board near here was more accurate. We got Fastpasses for Test Track for 12:55pm (I don’t want to wait standby if it breaks down, which seems often and is becoming a theme this week. Went to Mission: SPACE, where the Orange Team wait time was 40 minutes. Or so it was when we entered. Never seen the line loop around outside before. While in line, we could barely hear announcements about the Orange Team Training Schedule being delayed and that wait times would be higher than expected. Well, they were certainly telling the truth. It was well over 90 minutes, and that was with quite a number of people leaving the line. I don’t know if they reduce the number of Fastpasses given out in these circumstances, but they probably should just so the standby line can get moving. Never got a chance to ask what the issue was…I figured at least one of the simulators was down, perhaps for “cleaning”. Finally made it in and through, and still had time to kill before Test Track. Went to Club Cool for the free soda. Yes, we drank Beverly. We’ve had it before, but we still did it just to say we did. Drank a half cup each and dumped the rest, and then proceeded to drink the others. If you want to get the Beverly out of your mouth, the Ginger Ale (Krest?) is good. Beverly is deceptive – you don’t really taste it for at least a second before the taste buds recover and tell your brain what is going on. Really like Mezzo Mix. The rest are good, although the one from Israel is perhaps the least favorite other than Beverly. Killed some time in Mousegear, then went to Test Track. Went right through – no breakdowns for a change. We started to get hungry so we skipped over to Mexico for combo platter and a margarita at the Cantina. On the way, we stopped by the Odyssey Restaurant to hit the bathrooms. “The what?” you say? It’s that building that’s never open between Test Track and the Mexico Pavilion – flat, angular…see my What Is That Place? page for more info. The bathrooms are open, though – and they might be the nicest, cleanest bathrooms on property. We didn’t stick around afterwards as we didn’t need to see Turtle Talk again, especially without the kids. We just wanted to check out the ride portion as we had vague memories of the old sea cab ride. See the Mickey pumpkin forming? Went back to The Land and went on the Living With The Land ride, which we last did 10 years By ago. Not much has changed, but good for a look. 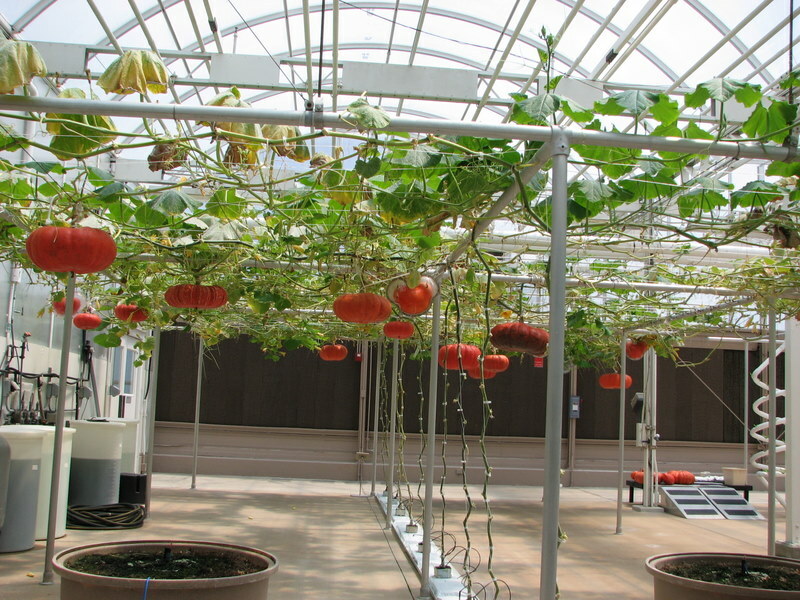 Look for the mickey pumpkin they are growing (may or may not be there). Then back on Soarin’ where a CM recognized us, probably by our lime green shirts. This time we were on Concourse 1, where my previous rides were always on Concourse 2. I noticed that in Concourse 1 there were some dirt artifacts on the film or projector, and a bit on the screen. I never noticed this on the Concourse 2 side. Then it was time to tour the World. 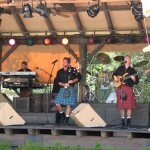 Stopped in Canada for a few songs by Off Kilter, and went to see the “Oh Canada!” circlevision movie for the first time. Rumor is that it is being updated shortly. Then to England for a couple of Welsh Dragons. We skipped a bit in places we didn’t really need to hang out because we’ve been through them before – France (got slushies on Day 1), Morocco (coming back later), Japan (I always miss the drummers), The American Adventure (next show was more than an hour away – still need to do this). In Italy we got Limoncellos. It tasted almost exactly like I thought it would – and I’ve never had one before. Didn’t stop in Germany, but did note that they have switched back to Beck’s and Beck’s Dark from our last trip, although a sign still implied that Spaten was available – but I didn’t see a spout for it outside. Skipped over China, and stopped in Norway. Wait time on Maelstrom was 40 minutes, but I wanted to try out School Bread first, and went into Kringla Bakeri. I can best describe School Bread as a large filled donut, with a vanilla custard cream filling, and a glaze and coconut on top. Yum. I figured I’d just walk it off. When we came out, Maelstrom was down to 20 minutes. We rode it, and then sat through the film which I think was a first for us. Went back to Mexico and rode the Gran Fiesta Tour for the first time. I’d like to have seen it prior to the introduction of the Three Caballeros. It was an OK ride – not worth any wait though. 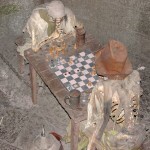 We did see the seating at the San Angel Inn though – boy, do they pack them in!!! And we heard two separate crashes of plates/glassware. Not surprising since it looks impossible for the waitstaff to walk. Then all the way back to the American Adventure and caught a few songs by ABBA cover group Bjorn Again, including “Dancing Queen”. Stopped back in Japan and watched Miyuki spin some candy treats including making a scorpion, then walked a bit through the store to come out and finally see the drummers (Matsuriza) – and get a little drizzle of rain. Then went to Restaurant Marrakesh. They seemed pretty busy but no real line waiting. We started with Beef Brewat Rolls and some bread. We ordered Roast Lamb Meshoui and Shish Kababs, both of which were good. The lamb was basically a shank, in case you are expecting a chop. Good taste, although a bit of a chore getting it off the bone. The waitress was very apologetic about how long it took, even though we had no problem with it and were not in a hurry. I did go into shock after looking at the bill – $160!!! For two of us?!? Then I noticed there were 4 meals on the menu, and drinks we didn’t have. Turns out it was the bill for the table next to us. The waitress was apologetic again and rushed off to get the correct bill, which was around $64 before DDE discount. That was more like it. She kept apologizing, and we kept insisting it wasn’t a problem. Afterwards we decided just to head back to the Beach Club and relax for the rest of the evening. Caught some of the Illuminations fireworks from our balcony, along with some of nature’s fireworks. It was pouring out and there was lightning, including one that couldn’t have been very far away. As usual it didn’t last long, and Day 3 was done. Today is morning Extra Magic Hours at the Animal Kingdom. We don’t have a long day planned here – we’ve done most everything before, and we’ve got reservations at the California Grill for our anniversary dinner tonight. The two things we’d like to do for the first time are Festival of the Lion King and Finding Nemo: The Musical, but aren’t required as we will definitely do them in December with the kids. 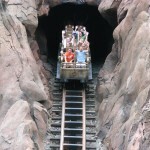 Of course, the Mad Dash is to Expedition Everest. I’m still not up to full speed, but I kept up well, and we got our Fastpasses, which were for 9:35am if I remember correctly. We then rode standby. After that, we walked down to Dinosaur, where there wasn’t any real wait, and rode that. DW and I hadn’t ridden that together in 8 years. After that, we headed to Kali River Rapids, which didn’t open until 9am, so we waited in line outside, and as soon as it opened everyone snaked up to the ride loading platform, and everyone got right on. Now I’ve seen where the people who end up on the lower side going down the big hill get soaked, and I’ve seen the wall of water go all the way up and hit the people on the far side flush. We were on the low side, and this time it was the low side that got soaked. They really could use with offering cheap towels like at the pools for a quick dry for the worse off. Didn’t mind so much…kept us cool for the rest of the day. 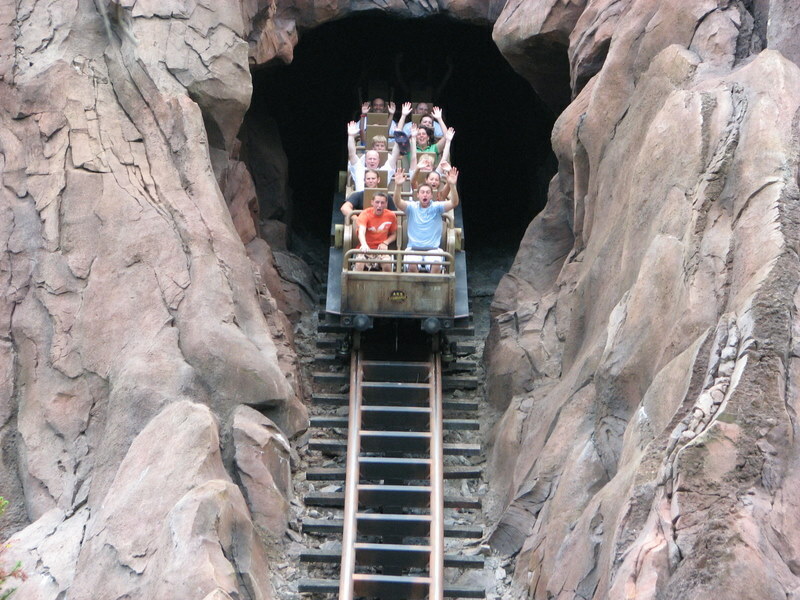 It’s close to our Fastpass return time, so we head back to Everest and I snap a few pictures of the ride. Then we head in with our Fastpasses and ride again. It’s pretty hard holding your hands up on some of those dips – the G forces are pretty serious. And I noticed that my ribs were starting to ache – apparently I was being pushed to the side into the car wall more than I thought. 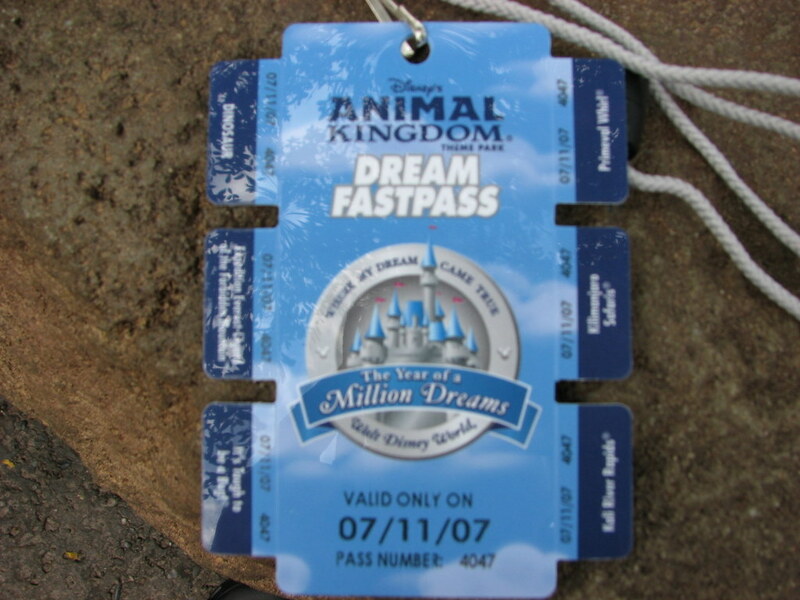 We arrive back at the unloading area, and hear a “Congratulations!”, and find out that everyone on that particular train had just won Dream Fastpasses for Animal Kingdom, as part of the Year Of A Million Dreams celebration! We actually won something! 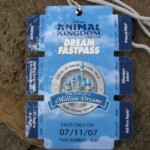 For more details of the Dream Fastpass, see my FASTPASS page, but it basically gives us Fastpasses for all 6 rides at Animal Kingdom that have Fastpass. So we turned around and rode Everest again! Since we had the extra Fastpasses now, we decided to ride Dinosaur again (where the line was longer now), and then grabbed an early lunch at Flame Tree Barbecue. While waiting in line, next to order, a woman came up to the CM with broken English and asked for a plain hot dog roll. After figuring out exactly what she was asking for, the CM got her a plain roll and wasn’t going to charge her for it, and then the woman asked for 10 of them!! The woman did try and explain that she would pay for them, but the CM really couldn’t charge for 10 plain rolls and said no, she could have the one for no charge but no more, even for a cost. The woman looked to me as if I might be able to help translate, and all I could tell her was “1 roll, no money”. That did seem to finally end the conversation, for which the CM thanked me. At this point we decided to head in to Festival of the Lion King, leaving Nemo for next trip. We tried to go to this eight years ago, but stood for over 45 minutes in excruciating heat to finally decide not to wait any longer. This time we went much closer to show time, and we almost didn’t make it in – they started limiting people until they saw how many seats were left. But we did make it in, and enjoyed the show – it just seemed too brief. We decided to ride Kali River Rapids one more time since we had the Dream Fastpass (we did not get as wet this time), and even though we still had three passes left (It’s Tough To Be A Bug – seen it several times; Kilimanjaro Safaris – takes a long time; Primeval Whirl – we hate it), we decided to skip out and head back to the Beach Club for a little rest, and go hit Epcot again. We left AK by 12:30pm. This time we did a bit of a “Drinks Around The World”, although not at every location. We first stopped at the Rose and Crown, where DW got a Welsh Dragon and I a Guinness, to go. We walked around to Mexico and DW grabbed a margarita, and I stopped in Germany for a Spaten, which they had outside this time. Then we finally stopped and visited the American Adventure, for the first time ever – it’s only been around for 25 years. First, we got to hear the Voices of America, an a capella singing group with beautiful voices, including a great rendition of the Star Spangled Banner. 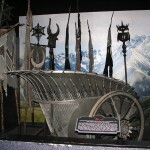 Then we finally saw the combination audio-animatronic and movie show, and all I can say is – I’m mad that we’ve not seen it before. This is probably the most Disney attraction that has been made in years – it beats the pants off the Hall of Presidents. You have to see it at least once. 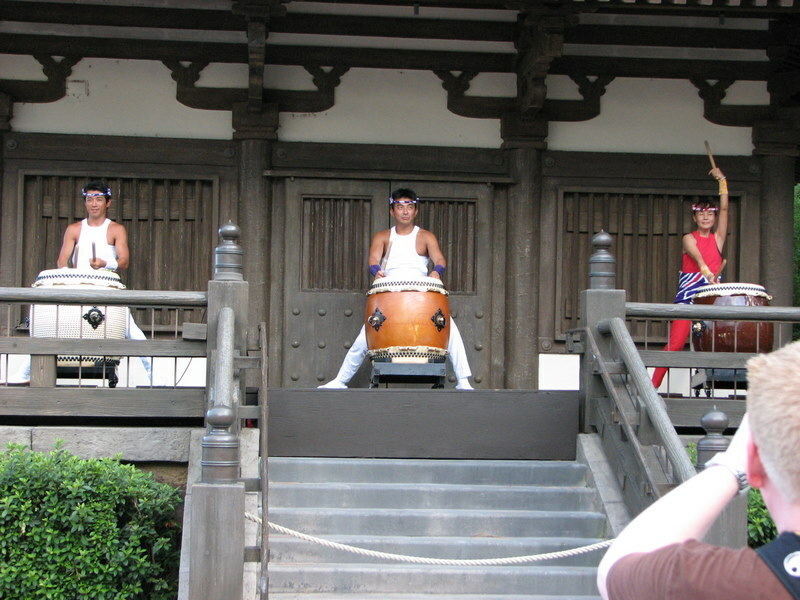 From there we slipped into Japan for some Kaki-Gori and a cold sake, and caught the drummers for a second time (I was 0-4 seeing them on previous visits)! Then a couple more slushies in France, one more swing by the Rose and Crown where DW got yet another Welsh Dragon and for me this time a Boddingtons. I forget his name, but the older gentleman who has tended bar there for years asked if I wanted a “shamrock”. I had to have him explain, and what he did was after pouring the Boddingtons (which has a thick head similar to Guinness) and let it set for a second, put the tap back in the cup just below the head, and poured a little more while moving the cup, which drew a darker shamrock shape on the lighter color of the head – something similar to the designs a coffee barista will put on top of a latte. Quite impressive. We chatted for a bit, then headed back to Beach Club to get ready for dinner. We went up and were seated right away. We were on the southern end with a window table, so we couldn’t see the Magic Kingdom but we could see towards Epcot and MGM, and saw some of the fireworks from Illuminations. We started with a couple of mudslides and the Hearts of Romaine Salad as an appetizer, and I ordered the red snapper with coconut curry sauce, summer veggies and rice, with DW ordering the filet of beef and mashed potatoes. The curry sauce was nice, similar to a massaman curry sauce which I love, and worked well with the snapper. Quite delicious. DW’s filet was “wonderful”, with some chives to the mashed potatoes for extra flavor. As we finished the entrees, it was time for wishes, so we head out to the balcony. They have speakers out there that seem specially timed such that all the queue points for the fireworks were in sync, much as if you were actually in the park. It was interesting to see the Magic Kingdom from up there at night in general, with everything lit up. We tried some pictures, but they didn’t come out (new camera, still working on all the settings). We noticed that we were able to see fireworks at what was likely Universal, or perhaps Sea World just before Wishes started. We went back in for dessert, which was a small pre-ordered anniversary cake, which was tasty but still too big for the two of us. Then it was back to the Beach Club, and one last night before we leave. We packed everything up, and planned to use the remote check-in desk to unload our bags and spend our last day over at the Magic Kingdom, and leave for the Airport straight from there. Well, if we could actually check-in, we may have done that. For whatever reason, the JetBlue system wouldn’t print our boarding passes. Then after several attempts, it wouldn’t even accept our info, saying that we had already checked in our maximum of three bags each – even though we only had one bag each. The girl working the desk had to call JetBlue and have them delete the check-in records for us, and ends up on hold – for 20 minutes! And when the JetBlue person came back on, she was surprised that she was still there! That’s inspiring…they deleted the records, and we try and check in again – and it fails again. We give up, but that means we have to change our plans as I don’t want to leave our luggage in the car to be stolen. Instead, we bring the bags over to the valet service at the Beach Club for storage until we return. Then rather than eat up time riding in the car and back (since we already lost over half an hour now), we decide to walk back to Epcot (our 4th time in 5 days!). Today is also the first time we actually see Art, the Greeter at the Beach Club. We first learned of him on the Travel Channel’s Great Hotels show, and when we called DD#1 during the week she kept asking if we had seen him. DW went and and spoke with him and got his picture while I was dealing with our bags, and he was just as nice in person as he was on the show. He had disappeared by the time I had finished. Off to Epcot, we grabbed Fastpasses for Test Track again, and went over to Mission: SPACE, but this time to avoid another long wait, and since I hadn’t done it before, we went through the Green Team side, where the ride doesn’t spin. It was an OK experience that way, but I find the Orange Team more interesting in general. Since we had time to kill before our Fastpass return, we went to Universe of Energy – it’s a good place to get out of the heat, but if you’ve seen it all before, it holds little interest. Then we rode Test Track again. 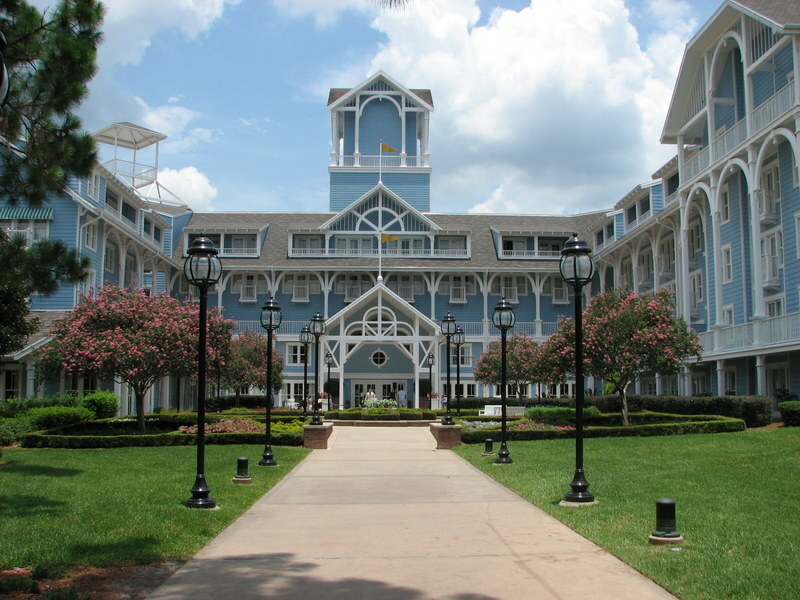 From there we do another walk around the world, this time stopping for the first time in Liberty Tree Tavern for a couple of decent burgers and fries, and then it was time to head back to the Beach Club one last time. I had a feeling checking in at the JetBlue counter would be problematic given our existing problems, so I thought to head back a bit earlier than planned. When we went in, Art was there again. We got our picture taken with him, and talked with him for a few minutes. I said that DD#1 had asked about him, and wanted to know if he still had the pin that Samantha Brown (from the TV show) had traded with him. He admitted he didn’t (it wasn’t a significant pin), but he was honored that a child would ask about him like that. He asked if we had an Anniversary pin, and we showed him the large pins we were given – he said not those, but he said he had one, but he apologized because it didn’t have a box and he’d have to polish it, and asked us to wait. He returned in a few minutes with a pin like the trading pins, which bore the words “Disney’s Yacht Club Resort/Disney’s Beach Club Resort” and “Happy Anniversary”, with a picture of Mickey in a suit much like Art’s, and Minnie in a wedding dress, holding hands. He apologized again for not having a box and explained that they don’t make those pins any more, and it was the very last one. We thanked him profusely and told him we’d definitely stop by with the kids in December. Then it was time to head to the airport. I get so confused on the way out of WDW. My plan was to take the Beachline back to the car rental place, and thought I had left by the appropriate exit – but apparently not, so I ended up on I-4 north to catch the Beachline from there. 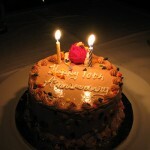 Last year, I ended up in Celebration somehow and had to make a U-turn. On the Beachline we hit heavy rain a couple times, so I was worried about delays, but it did not seem to affect the airport. We spotted the Hooters, made the next left, and dropped the car off. They quickly checked in the car, and the van was ready to roll so we hopped on and got to the terminal pretty quick. We check in at the JetBlue counter, and of course the person says “So, you’ve already checked in?” A quick explanation and she had us checked in quicker than I expected. We hung out in the main lobby for a bit before going through security. Since I hadn’t picked up anything for myself at the parks, I picked up a Grumpy shot glass at the Disney store right there. I managed to hook in to a hotspot with the laptop and check my e-mail. We went through security and then to the gate. They have CRT or LCD panels for the flight information for the current flight at the gate. Our gate listed a flight to White Plains that boarding had closed – but they hadn’t even begun boarding yet! Not sure why the info was wrong – as if they were on some sort of timer. Eventually that flight cleared, but we got moved to another gate and our plane came in – “Bibbity Boppity Blue” – how appropriate! Even with the gate change, our flight left on time, and soon we were, alas, home. Our one last adventure was locating our car. I snapped a picture with my mobile phone of the row and floor sign – but in looking at it, I couldn’t make out the floor – it could have been a 3 or a 5 because the low resolution of the screen was “squishing” the image. Fortunately I was able to retrace our steps on the correct floor. 45 minutes later we were home…and planning our next trip.